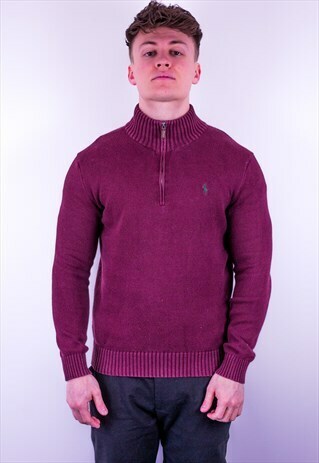 Vintage Ralph Lauren 1/4 Zip Jumper in Burgundy - Sized Small. Modelled by Greg who is 5ft11 (180cm). See our stock first by following us on Instagram - 'thriftygregory'. Be sure to check out our other listings! If you have any questions just send us a message! All our items are vintage so minor signs of wear are to be expected and add to the character of the item. Any notable flaws will be noted above in the description.